The beautiful season of autumn is upon us, which means that soon the breathtaking foliage will be center stage for viewing. What better way to enjoy the spectacular views, than to embrace the stunning outdoors of Meigs County? Whether you are biking along the Middleport multi-use trail that allows you to marvel at the state’s namesake that is the mighty Ohio River, stopping to play at the impressive Star Mill Park in Racine that has something to offer to all of its occupants, or walking along the welcoming Eastern Local walking trail, there are endless sights to see as we embrace another season change throughout the state. Meigs County is unique in that it truly does offer a world of beauty to behold by its residents and visitors alike. With that in mind, I am pleased to announce that prior to the completion of this calendar year; Meigs County will have its own Pedestrian Master Transportation Plan. The Meigs County Health Department was awarded a planning grant from the Ohio Department of Transportation (ODOT). This funding has allowed the Creating Health Communities (CHC) Program, that is housed at the health department, to work with a planning team, Toole Design Group, to develop this master plan. Toole Design Group, the CHC Project Director, and the Active Transportation Team have dedicated a great deal of time to this plan’s development. It is worth mentioning that the Active Transportation team is comprised of several dedicated Meigs County community members and government officials, ODOT employees, Buckeye Hills Regional Council employees, just to name a few. Furthermore, there has been extensive data collection and collaboration with the partners to ensure the plan’s successful completion. This plan will truly put Meigs County on the map. A master pedestrian plan will allow Meigs County to further seek funding to embark down further infrastructure improvements that will make the county even more walking, rolling, and biking friendly. Although our deadline for completion is right around the corner, we still need your help! The Meigs County Health Department and Toole Design Group are still seeking community input with the Pedestrian Master Transportation Plan. The Health Department and Toole Design Group will be participating in the Syracuse Community Health Fair this month; at the fair the draft pedestrian master transportation plan will be available for the public to view and make comments and suggestions for improvements to the document. It is our goal to make this pedestrian plan the best it can be, and this means it needs to be as representative of the county as possible; no one knows the county better than the residents who make this area great. With that in mind, please join us on Tuesday, Oct. 16, 2018, from 9 .m. to noon at the Syracuse Community Center to have your voice heard in the completion of the Meigs County Pedestrian Master Transportation Plan. If you would like to know more about the efforts that are being taken to develop the pedestrian master transportation plan for the county, or how you can get involved, please contact me at the Meigs County Health Department at ciara.martin@meigs-health.com or (740) 992-6626. 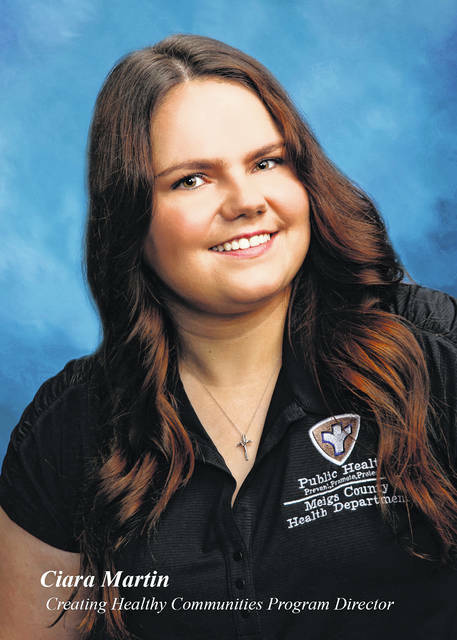 Ciara Martin, MPH, is the Creating Healthy Communities Program Director at the Meigs County Health Department.